An aquamarine coastline reveals tree-house villas perched on a secluded, tropical hillside. Lounge by your private infinity pool then stroll to the powder-sand beach, one of the best on Mahé. 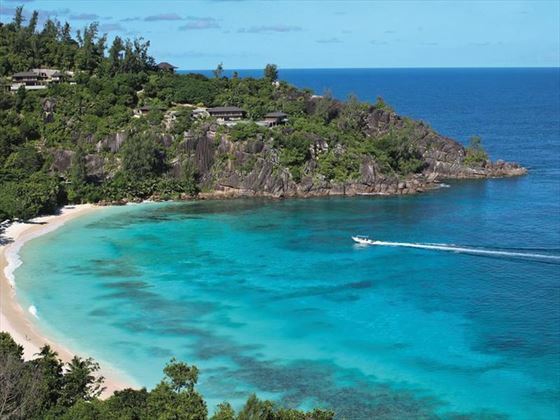 Four Seasons Resort Seychelles on Mahé Island is perfect for a luxury Seychelles holiday. Classic and pure, just like your love. 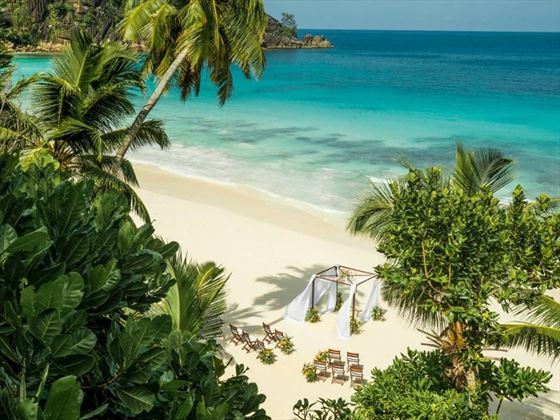 Step onto the pristine beach of Four Seasons Resort Seychelles and get married barefoot, beside the Indian Ocean. This fabulous resort is nestled on the secluded bay of Petite Anse, sitting along the southwest coast of Mahe. Hidden within a jungle-clad hill, the resort feels intimate and secluded, offering you the ideal island lifestyle experience. The original of your birth certificate. If you have changed your name, the original deed poll proof of name change will be required. Please note that if you have been divorced and have reverted to using your maiden name then this counts as a change of name, and proof of that change will be required. 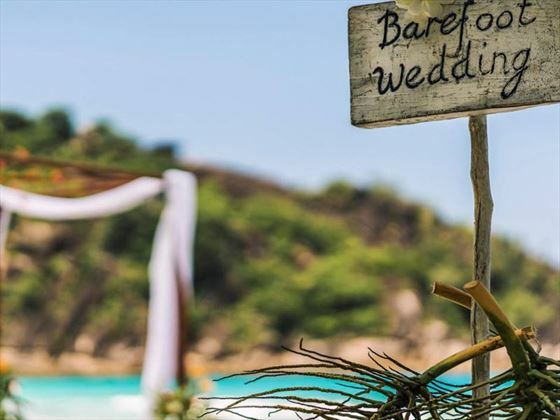 Guests marrying in the Seychelles will need to send photocopies of the documents listed to us at least 12 weeks before the date. In most destinations, your wedding ceremony will be conducted Monday to Saturday (excluding local holidays and subject to availability). Generally, your wedding will take place in the grounds of the hotel unless otherwise specified. Many hotels offer wedding gazebos for extra privacy. Some hotels may offer more than one wedding per day with the first wedding taking place at around 10am with the last wedding at 4pm. The majority of our weddings are conducted by a marriage officer whose title varies depending on the resort. Where it is possible to be married by a Minister, the ceremony will be non-denominational unless otherwise stated and will be a Civil wedding. Tropical Sky Weddings and the information given above only apply to couples: who were born in the UK/Ireland and have a valid UK/Irish passport (with some months validity on return home). If you do not fulfil these requirements you must advise us. Couples should be referred to the embassy of the country of origin and the country where they wish to marry as they may require extra documentation to satisfy their own embassy requirements – Tropical Sky cannot advise on this and couples must investigate this on their own. Additional wedding administration fees may apply if you are of mixed nationality and you will require additional apostilles on the marriage certificate as well as a authentication letter. Please note that for the mixed couples all documents must translated in English and notarised. If you are of French, Swiss or Italian origin, additional procedures prior and after the wedding will be required of you. Costs are minimal & payable locally. Average additional fees would be €20 for an apostille stamp on your marriage certificate (this is to confirm the wedding is legal in your own country). You may also require an extra copy of the marriage certificate (€8) and an authentication letter (€20). Why book your Seychelles Wedding with Tropical Sky?